Welcome to another Handmade Monday. Click the link to find out more. Lots of things are still on my to-do list...but nothing seems to be getting completed! making a pattern or making a mess? but probably was more successful in making a mess than making a lampshade! Still, I think I've got the basics of the pattern sorted. On this one, I'm restricted by quite a specific brief, which in some ways is really good because it makes you think along lines you might never have considered. I quite like that, once you've solved all the problems surrounding it! One of the problems is that I'm using paper for the lampshade (the papers they'll be giving away free in the magazine) so fire safety was a real issue that needed discussing and researching pretty thoroughly. The fire safety issue will be addressed in the feature. Another problem is that the papers are all just A4 size, so need some fairly creative joining! I'm going for tree shapes stitched over the joins. Also - and I've not fully worked this one out yet - I need to make some cut-out shapes in the shade. I'm thinking falling leaves (the obvious choice for this time of year and no need to look far for inspiration!) but we'll see. 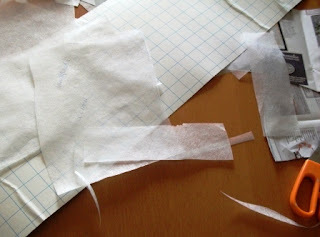 The cuts need to go through the adhesive safety backing too (my fingers are scared for their safety already!). I still haven't worked out a trim for the top and bottom of the shade. That's rapidly becoming urgent and I doubt if I have anything in my stash. Then there's a couple more commissions: an old picture frame to transform into a chalkboard to begin with, then some tatty old placemats need a creative transformation! It all needs doing in the next week or two (with patterns and instructions written up too!). This would all be ok - leisurely, even - if I didn't have anything else to do, but ... (you know what's coming, don't you?) it's obvious over here that Christmas is on its way and people are making preparations! It's making it difficult to fit in all the things I need to do - because all the gifts on my website are painted to order - and I know it will only get busier. Anyway, it's time right now to enjoy a little break in the form of Handmade Monday - leave your link and enjoy seeing what everyone else is sharing too. 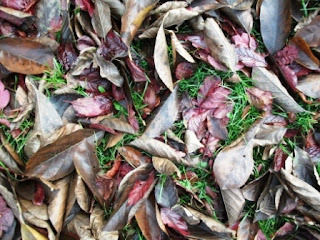 Don't forget to leave a few comments behind, especially where you've enjoyed someone's blog post - blog comments are always appreciated and often reciprocated. Now where did I put my cup of tea? Oh! I nearly forgot! You still have time to enter my giveaway - click here to check it out - you could win pretty much whatever craft supplies you like! Can't wait to see what trim you come up with! Been wanting to make a lampshade for ages, but it's always been one of those projects that gets put on the back burner, lol. Good luck! Gosh that lampshade looks a bit mind boggling! Cant wait to see the finished result! Can't wait to see the finished lampshade. Looking good so far. 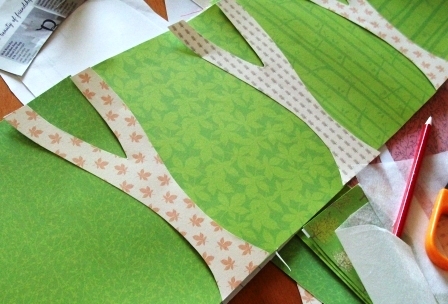 The cut-out leaves sound a good idea and can't wait to see the finished owl too. Hope you have a good week. Goodness me you're busy. Like what you have done to the lampshade so far.Good idea to put them over the seams. Liking the owl so far. That owl is really cute! Hope your busy week is not too stressfull. The lampshade sounds intriguing but also frightening at the same time, a long time since I have recovered one and maybe long overdue. I like the idea of the trees for covering the seams, it's true that sometimes restrictions make you think differently. 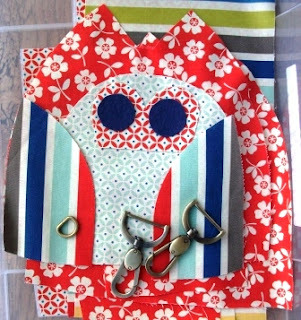 I love the owl fabrics, can't wait to see the finished pieces. Looks like you're going to be very busy! I love the fabric of the owl and cant wait to see it all complete. Hope you have a great week. The lampshade is looking fab and I can't wait to see the owl. I think your week has extra days in it compared to mine as you seem to achieve so much! I really like the colours of your lampshade, and the fabric choices for your owl! When do you find the time to sleep! Wow! Sounds like you have a busy time coming up! Good luck with all your projects, I am looking forward to see how the lampshade and owl turn out. Hiya, I've been reading your blog for a while and finally taken the plunge to join in!! Love the look of the lampshade - the trees are a brilliant idea to cover the joins :-) Can't wait to see how you finish it off! You sound so busy, hope you manage to fit everything in! I would love to learn how to cover my own lampshades. Wow you are a busy bunny, like you i have a big to do list but I've not even started on it after my break. Can't wait to see the finished results to your lampshade.